Welcome to E.I. 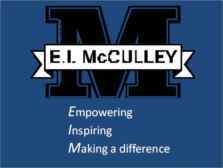 McCulley Public School! We are pleased to provide an outstanding education at E.I. McCulley Public School for our students. Innovative programs that meet the needs of all our students are taught by our dedicated and professional staff who care about your child. Our school provides extra-curricular opportunities that encourage the development of excellence, integrity and respect.